Note – We received a promotional copy of this release from Funimation in exchange for our honest review. 2 years ago, I sat in a darkened room at Anime Expo and watched the world premiere of The Ancient Magus Bride. I watched as the opening episodes captivated the audience with its fantastical setting, hauntingly beautiful soundtrack and, of course, stellar animation. The Ancient Magus Bride would go on to enjoy a successful two-cour run, the first of which was recently released by Funimation for fans to take home! I’m not going to dive into a review of the series itself – except to say that if you haven’t had a chance to watch it yet, you definitely should. With that being said – let’s take a look at this blu-ray set! The detail and quality of the outer box is superb. I was particularly impressed by the art on the back – the shot of Chise in Magus robes, framed by the gold border, is striking to say the least. It made me want a full-sized print to hang up somewhere in my house. Inside of the box are three things: the blu-rays, a booklet on the world of Ancient Magus Bride, and another box! Starting with the booklet, it’s a thick-paged, brief introduction to the various characters and organizations that occupy the world of The Ancient Magus Bride. I know I’m not alone when I say that I miss the gaming days of old, when titles came with thick booklets of information on characters, battle systems, tips and tricks – so any opportunity to get something like this, even if it’s not for a video game, is always going to be like icing on the cake for me. The material quality was spot-on as well. Inside, there’s alternative art that features everyone’s favorite housemaid, Silky, as well as Ruth, showing off his dog/wolf form. Now, the extras within the set really help to distinguish it from your run-of-the-mill release. Too often, we see a textless opening and ending and some previews and call it a day. Thankfully, this set includes a lot more than that. There’s a Twitter Q&A, featuring ADR director Kyle Philips, as well as voice actors Dani Chambers (Chise) and Brian Mathis (Elias). At just over 15 minutes, it’s got some great content. There’s also a commentary for episode 8 featuring the same cast. Rounding out the extras on the set is the inclusion of parts 1-3 of Those Awaiting A Star – the OVA/prequel to The Ancient Magus Bride. All in all, a healthy selection of extras that adds some serious value to the set. Finally, there is the “box within the box” – featuring a selection of premium art cards and a fabric poster. I’ve handled my fair share of art cards in the years that we’ve been reviewing box sets, even limited edition/premium ones. These art cards are breathtaking – and sturdy! The fabric poster is a great touch as well. 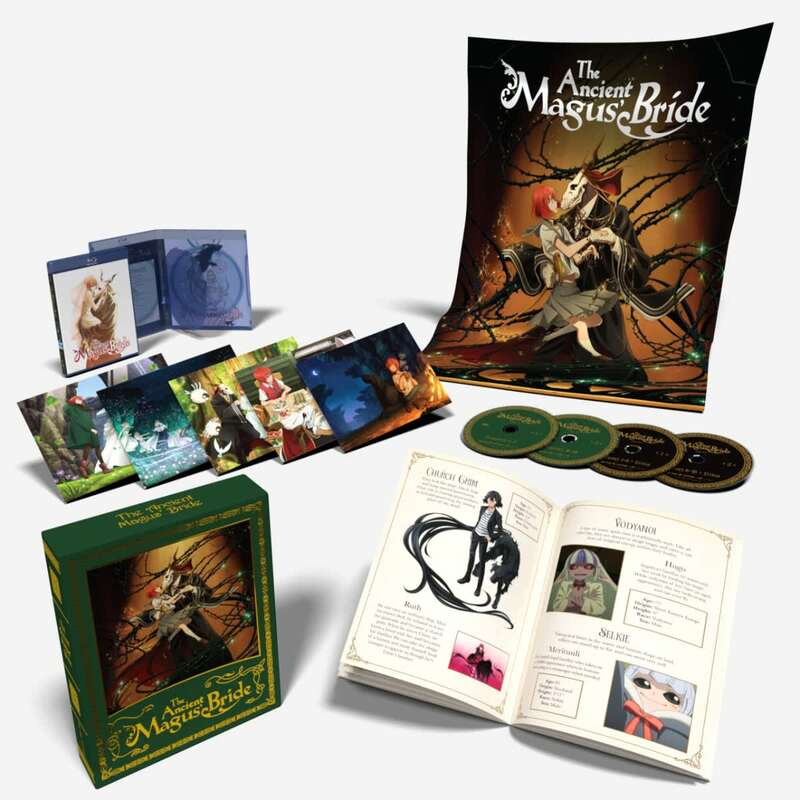 Overall, Funimation’s really gone all-in on this limited edition set of The Ancient Magus Bride. You can tell this is a title they feel particularly proud of, and I hope that once season 2 lands, it receives similar treatment. If you’re a fan of the show, definitely pick this up!